In a blender, combine olive oil, vinegar, wine, hot sauce, hoisin, garlic, salt, peppercorns and ginger. Puree until smooth. Reserve half of the marinade and refrigerate it. Into a large bowl, pour remaining marinade. Add chicken and onion, then stir gently to coat. Cover and refrigerate for about 1 1/2 hours. When chicken is ready to cook, heat a grill to high. Oil grates. 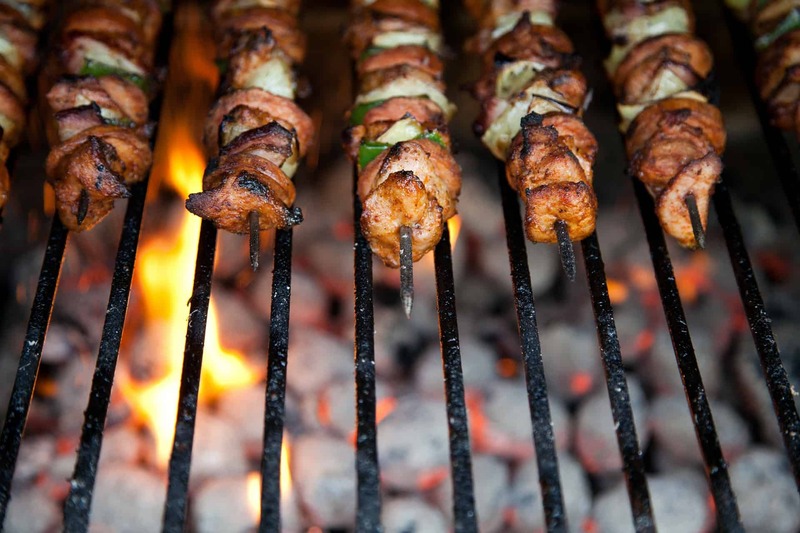 Divide meat and onion chunks among 4 skewers (if using wooden skewers, soak them in water for 30 minutes first). Reduce heat on one side of the grill to low. Arrange skewers on the cooler side of the grill, then cover and cook for 6 minutes, turning frequently, or until an instant thermometer reads 165 F at the center of the chicken. Serve skewers with the reserved marinade for dipping.